Ron Mann’s latest documentary, Carmine Street Guitars, takes us inside Rick Kelly’s custom guitar shop located at 42 Carmine Street in New York’s Greenwich Village. Many of their guitars are built out of reclaimed wood stripped from old buildings that has been salvaged from construction sites, and the quaint little shop has gained a dedicated customer base of musicians who love the unique sounds of their beautifully handcrafted instruments. Rick runs the small store with help from his elderly mother, who answers the phones and makes sure the photos of musicians that decorate the walls are straightened and dusted, and he works in the shop alongside his protégé, the young artist Cindy Hulej, who also builds guitars and has her own line of instruments featuring intricate wood burning designs. Shot over five days in a cinéma vérité style, the film allows us to hang out in the shop. We watch as Rick and Cindy carve out the guitars, and musicians like Charlie Sexton of the Bob Dylan Band, Kirk Douglas of The Roots, and Nels Cline of Wilco, who is looking to get Jeff Tweedy a special guitar for his birthday, come into the shop to swap stories and often play a tune. Dallas and Travis Good of The Sadies, who are also credited with providing the film’s score, stop by at one point to check out the instruments, and Jim Jarmusch even comes in needing new strings for his acoustic guitar. The structure is loose, but there is a rhythm to Carmine Street Guitars that is both relaxing and deeply satisfying to watch. It’s also surprisingly reflective at times, including a moving acoustic performance by Eleanor Friedburger of her song “I Am the Past,” which keeps with the film’s themes of trying to protect a part of New York’s history in a neighbourhood that is being increasingly gentrified. The shop itself has an old school feel to it that harkens back to Greenwich Village’s iconic folk music scene of the 1960s, and many of the people who step into the shop do so to relive a little bit of that history. The shop is not only giving old wood new life, but also allowing small parts of New York City to live on, and as much as Carmine Street Guitars is a portrait of a master craftsman at work, it’s also a bittersweet ode to people who are trying to keep a little bit of the past alive in a rapidly changing world. 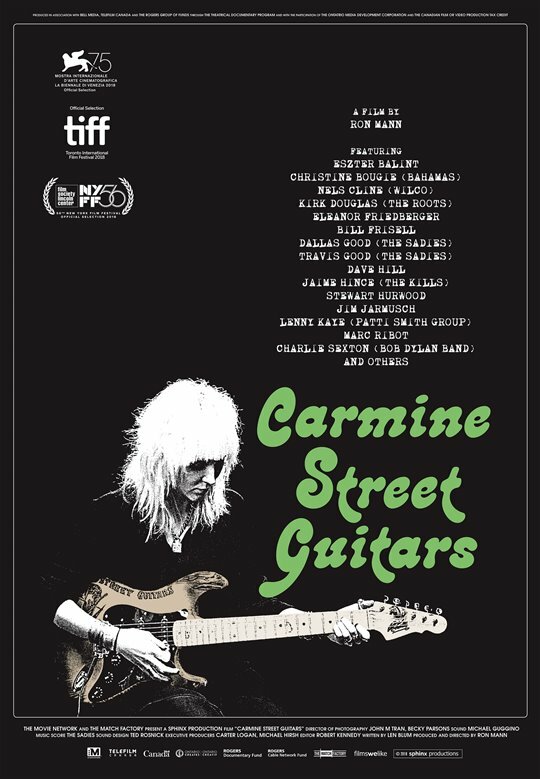 Carmine Street Guitars is now playing in limited release at TIFF Bell Lightbox in Toronto, tickets and showtimes can be found right here.